Another hodge podge of stuff. Many of you can stop reading at one point, you’ll know when LOL! First, my 3 of Diamonds. Today I was playing with paint a bit, and tried a make-a-stamp experiment, which worked really well. 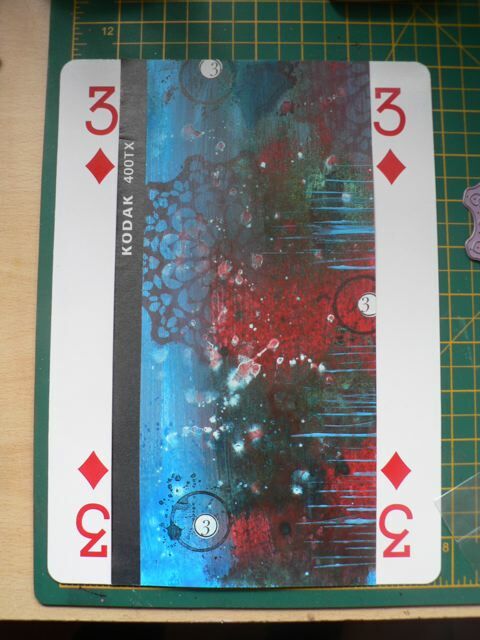 It’s all very grungy – I started by brushing on slightly watered-down acrylic paint, red and turquoise. I topped that with a spritz or turquoise Cosmic Shimmer. 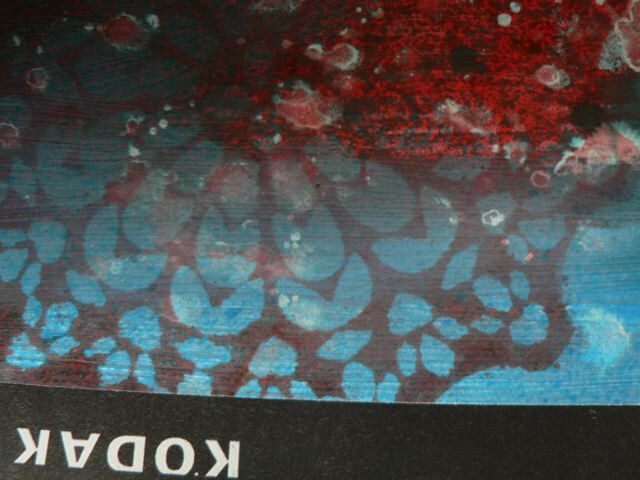 It was interesting that the bits over the blue stayed blue and the bits over the red went a nifty verdigris colour. I thought so long as the paint was dry the blue would stay true even over the red – it didn’t. I added a few lines in the blue. The numbers, and the black strip, are from a magazine. I love the black line and luckily the article has a number of them – they frame the photos – so I can cut them out and save them for other uses. 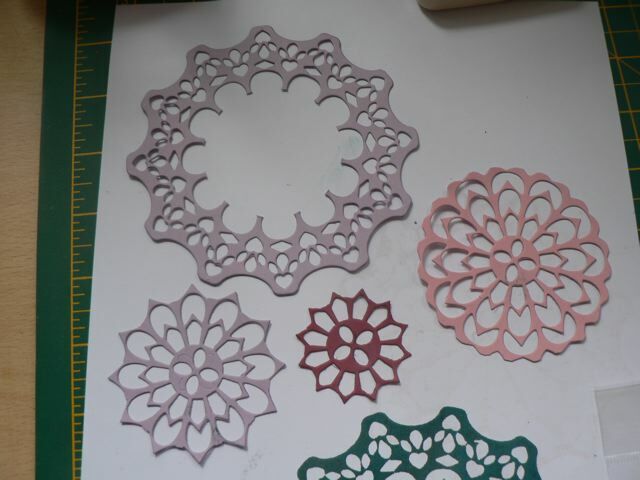 The stamped doily is made from a Cheery Lynn die, cut from fun foam! 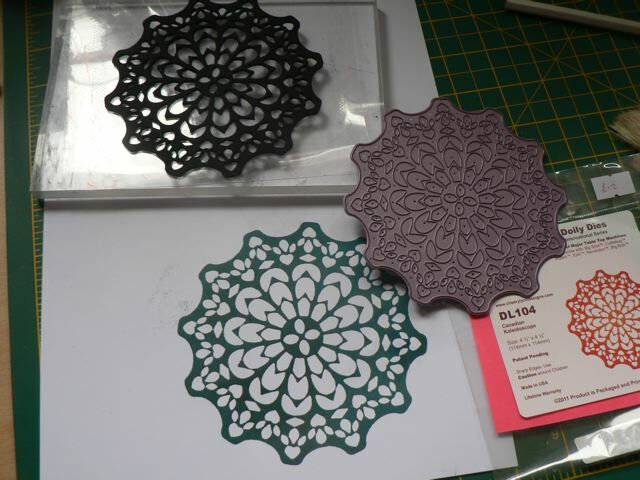 So you can see the die, the fun-foam cutout, and the resulting stamped image. I’m shocked it worked, frankly. See how well it prints? I really like the frame from the leftover border bit as well! So today we have the usual BIG CARD post, the make-a-stamp bit, the cutting up die cuts bit, and upcoming, computer problems. Now, you can feel free to look away. I have been having the worst problems with my computer. Trying to visit WOYWW desks for the last two weeks (and, indeed, trying to do the BlogBits feature for UKS – anything that involves blog hopping) has resulted in my Mac grinding to a halt. The fan runs, the loading bar fills S L O W L Y and if I have my Activity Monitor open (which shows my the CPU usage for the various applications) I can see my browser turn red and NOT RESPONDING appears. This seems to happen every time I visit a blog. My problem was that a couple of things happened simultaneously – first, blogger changed some stuff. Not sure what, as I am not a Blogger blogger. And I updated my browser to the newest version. Now with both of those things happening at the same time, it made it impossible to figure out where the problem was when it occurred! One thing I noticed was something called the ATS Server kept popping up whenever I opened my browser. And it was using a LOT of CPU resources. And while it was, that was when the browser stopped responding. It was taking me something like 15 minutes to click on a blog, load the page, switch to the comments section, type, then try to load the comment! I was literally tearing my hair out. I went looking and found this process is a font checker. It verifies the fonts when you try to use them. Basically I had to validate all my fonts, remove the ones that came up with warnings (including Saru Dingbats, the fab flower dingbat font I used to cut ALLLLLL the flowers to decorate my rolling tote) and in the process removing those ballsed up my Mail program, corrupting all the mail headers info (the TO, FROM, SUBJECT) which then forced me to remove the font cache file and reboot. That brought back mail OK but still the same slow performance problem. DH (love that guy!) came home for lunch and disabled Spotlight completely (I also had tried to omit all PDFs from Spotlight searching as that was a known issue with the ATS thingie) and then spent a couple of hours removing almost 200 fonts. Only time will tell if all this is going to get me back to being able to actually visit and comment on blogs but I am encouraged by the fact things already seem slightly quicker. So if I didn’t make it to see you for the last two WOYWW, forgive me. I did try, but there are simply not enough hours in the day to only do 4 an hour! And I keep forgetting the scrap Scene Mr. Linky or WIPs on Monday but here it is! Categories: art, BIG CARDS, musings | Tags: cards | Permalink.